We cover a lot of videogames, comics, and movies here at the Spark- but sometimes it is okay to get outside. That's especially true for kids, and NSG has a pretty cool lineup of summertime goodies to do just that. How does your own set of Monkey Bars sound? This climber features innovative design and high quality materials for great outdoor active climbing and fun for kids ages 3 - 6. 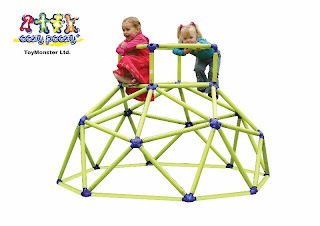 This climber is packed with play value and priced at SRP $219. It is lightweight, durable, made of UV resistant materials and is easy to assemble and disassemble. Holds two children maximum weight load of 150 lbs. First they walk. Then they skate. 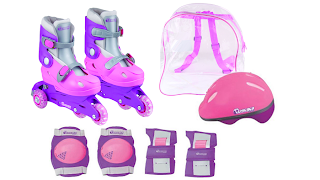 This In Line Training skate set introduces toddlers to skating with 3 wheeled training skates that morph into big kid in-line skates with simple adjustment. Comes in cool backpack that includes safety padding, helmet and hardware to adjust skate size and wheel position. Get kids moving with this kid powered go kart. At $189.99, it's a great value that's perfect for a big birthday gift or to put away for the holidays. 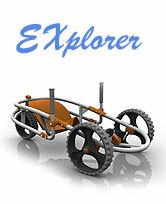 Pedal power lets kids move and groove while using easy grip handles to steer this 3 wheeled wonder. Ages 5 and up - Maximum weight load 100 lbs. No disrespect to the skates (because that's a pretty great idea right there), but I can't imagine there being anything cooler than having your own set of Monkey Bars. That's just plain old awesome. Although when I think about it, the Go Kart is pretty cool too. The little guy just looks so darned futuristic. It'd be right at home bouncing across the Lunar surface wouldn't it? And I love the trike form factor. Really neat. I wish it didn't have a 100 pound weight limit because I'd buy one right now. Flash Mob. Zumba: Fitness Rush Style. Game of Thrones & Hunger Games... Cookbooks? How Young is too Young for Facebook? Science asks Are We Alone?